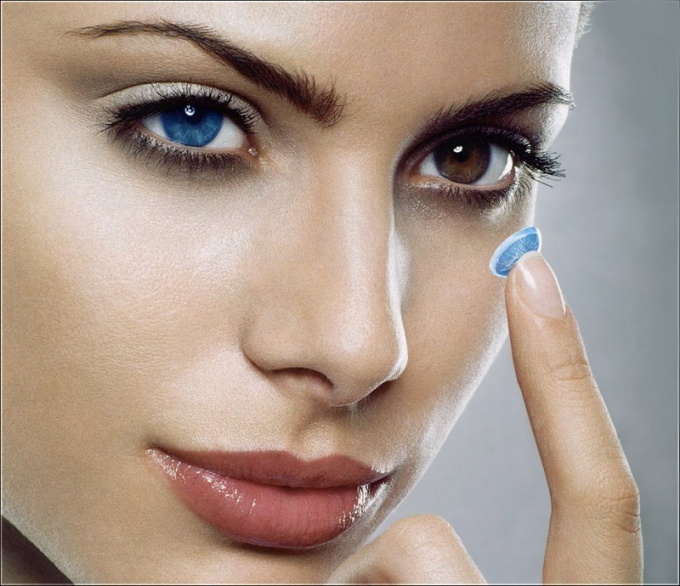 Using contact lenses not only correct vision, but also to change appearance, to make it brighter and more expressive. It is important to observe the rules of lens wear, to avoid damage to health. Colored contact lenses are designed to radically change the color of the iris. However, they do not contain a dye in the center of the pupil and therefore does not distort color perception owners. However, one must keep in mind that when you change the lighting, changing the diameter of the pupil. If the pupil is narrowed, in the transparent region of the lens can be seen the iris is a different color. If expanded, the painted area falls into the field of view and creates a sense of dimness in the eyes. Colored lenses are better off driving in the dark when they impair vision. To bring the type of color lenses natural modern producers to create a picture of the iris using 2 or 3 dye, simulating a border, foreground color, and other features. Painted a layer found in the inner part of the lens and not in contact with the cornea, so there is no fear of getting pigment in the eye. Tint contact lenses colored much weaker than the colored ones. Their task is to enhance the natural color of the iris and give it brightness. The pupil area is also painted, so the color reproduction, though weak, but broken. On the other hand, in bright light when pupil constriction is not visible a real iris, and because the contact lenses look more natural. Carnival, or crazy lens, have bright colors or unusual patterns in the form of a cat's eye, dollar sign, soccer ball, etc. They are designed for special occasions, not for everyday wear. Colored contact lenses are not intended for continuous wear, because almost impenetrable for oxygen. You can wear them no longer than 8 hours a day and be sure to remove for the night. This applies particularly to fat fancy lenses that thoroughly reduce the quality of vision: color, clarity, contrast. You can't use lenses longer than the period specified by the manufacturer, because over time they accumulate organic deposits that cause inflammation and irritation of the eyes. In addition, soft contact lenses easily absorb a variety of contaminants from the environment, so do not want to wear them in a smoky environment and manufacturing where the use of harsh chemicals. The solution in which the lenses are stored, should be changed daily. To insert and remove the lenses only with clean hands. Those who use cosmetics, so you need to pick up the ink and the shadows, so they don't crumble. Particles of paint trapped under the lens, causing the sensation of sand in the eyes. You cannot select lens without consulting a doctor. Unsuitable lenses create a feeling of discomfort and damage eyesight.